Artwork by Irvin Tepper. Edited by Jo Farb Hernandez, Paul Schimmel. Text by Edmund Burke Feldman, Marc Freidus, James Harithas, David Ross, Armando Surez-Cobin, Janet Koplos, Robert Milnes. Artwork by Sigmar Polke. Edited by Paul Schimmel. Text by Maria Hamburg Kennedy. 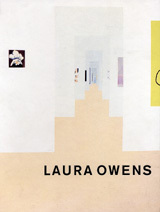 Featuring the work of more than 150 exemplary international artists, this first comprehensive catalogue of the permanent collection of the Museum of Contemporary Art, Los Angeles, is published to accompany the museum's major 2008 permanent collection exhibition Collecting Collections. With short texts on each artist, as well as essays by Chief Curator Paul Schimmel and Senior Curator Ann Goldstein, it is a major milestone in the museum's publishing history. Featured artists include historical figures like Ad Reinhardt, Arshile Gorky, Franz Kline, Diane Arbus, Alberto Giacometti, Morris Louis, Mark Rothko, Garry Winogrand, Barnett Newman, Andy Warhol, Willem de Kooning and Piet Mondrian; contemporary Los Angeles artists like Doug Aitken, John Baldessari, Chris Burden, Vija Celmins, Mike Kelley, Catherine Opie, Nancy Rubins, Paul McCarthy, Lari Pittman, Diana Thater, James Welling, Laura Owens, Bill Owens, Charles Ray, Raymond Pettibon, Jason Rhoades and Edward Ruscha; New York artists like Vito Acconci, Robert Gober, Nan Goldin, Brice Marden, David Salle, Claes Oldenburg, Julian Schnabel, Cady Noland, Richard Prince, Kara Walker, Robert Rauschenberg, Cindy Sherman and Kiki Smith; and international artists like Francis Alÿs, Maurizio Cattelan, Thomas Demand, Rineke Dijkstra, Peter Doig, Marlene Dumas, Olafur Eliasson, Rodney Graham, Andreas Gursky, Mona Hatoum, William Kentridge, Anselm Kiefer, Chris Ofili, Gabriel Orozco, Hiroshi Sugimoto and Rirkrit Tiravanija. 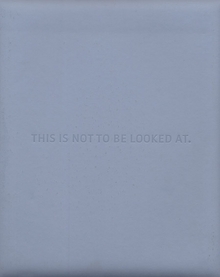 The title This Is Not To Be Looked At is derived from a work in the collection by John Baldessari, dated 1966-68, which reproduces an Artforum cover that features a Frank Stella painting also owned by MOCA, titled "Union III" from the Irregular Polygon series (1966). Hardback, 10.75 x 12.5 in. / 384 pgs / 400 color. Hardback, 11.75 x 10 in. / 60 pgs / 36 color. Published by Locus + Publishing Ltd.. This comprehensive overview, the first to appear in almost a decade, examines an artistic career, that now must be viewed as one of the most fascinating in the history of contemporary art. 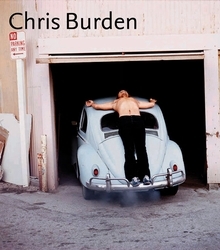 From his highly controversial and seminal performance works of the early 1970s, to his complex, imaginative installations and monumental sculptures, the art of Chris Burden uniquely informs as well as incorporates the major artistic undercurrents of the last three decades. 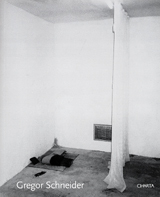 Not only has the artist made a major contribution to the history of body-related performance art, but the artist's fascination with systems of power, societal organization, architectural structure and technological systems, have resulted in an extraordinary body of sculptural objects and environmental installations over the last 35 years. In compiling this publication the artist has worked closely with curator and long time associate Fred Hoffman, taking this opportunity to re-examine his work afresh and revealing images that are unpublished or rarely seen. Hardcover, 9.5 x 11.5 in. / 256 pgs / illustrated throughout. Poetic and lush, Robert Rauschenberg's Combines present layers of complex and sometimes conflicting information. This approach, first explored by Rauschenberg in the early 1950s, proved prescient and has become increasingly relevant in the current age of cascading information, when even the most ground-breaking artists are referencing and sampling disparate elements to create new forms. The Combines suggest the fragility of definitions, the fluidity of materials and the complexity of forms that are characteristic of Rauschenberg's works. The artist's handling of materials provides a precise physical evolutionary link between the painterly qualities of Abstract Expressionism and iconographical, subject-driven early Pop art. 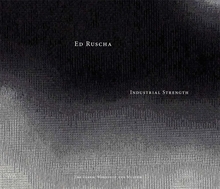 This book focuses on the works created roughly between 1954 and 1964, the most important decade in the artist's 50-year career, and constitutes the most complete survey of the Combines ever presented, as well as the most rigorous analysis of their political, social, autobiographical and aesthetic significance. An introductory essay by exhibition curator Paul Schimmel titled “Reading Rauschenberg” offers an iconographic analysis of the earlier Combines, based on in-depth conversations with the artist. Other texts help to contextualize the Combines, such as Thomas Crow's essay that calls them the major artistic statement of their time, and the one body of art that could simultaneously hold its own from de Kooning to Pop art. Clth, 9.75 x 12.25 in. / 324 pgs / 172 color. Essays by Ulrich Loock and Paul Schimmel. Interviews by Hannelore Reuen and Ulrich Loock. “Making is a higher form of thinking,” claims Gregor Schneider, who began to make art as an adolescent. So urgent was his desire to be an artist that, in order to pay for the materials he needed to make his sculptures, he even worked as a gravedigger. Introverted, self-effacing and a close observer of human behavior--with a particular passion for the lowliest of social categories--Schneider has developed an all-absorbing identification with his work, living together with it night and day in an apartment he soundproofed from the rest of the world. Schneider has tried his hand at film, painting and sculpture, but most remarkable is the installation he created between 1985 and 1994, in his home. There he built rooms within rooms, walls in front of walls, doors that led nowhere and windows that opened onto dead spaces. When asked about his motivations, he would defiantly proclaim, “I can't do anything else.” This monograph surveys his work. Paperback, 9 x 11 in. / 232 pgs / 80 color / 370 bw. Published by San Jose State University. 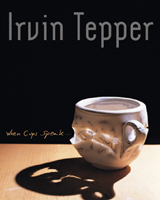 For the past 25 years, Irvin Tepper has been engaged in an exploration of the physical and conceptual idea of the coffee cup. Endowed with animistic qualities, Tepper's cups (made of porcelain or bronze, seen in photographs and drawings) hear, think, and even speak, commenting on the stories they overhear and the lives they witness as we drink our daily cups of coffee--with friends, business associates, or just the daily paper. Published by Scalo Publishers/Museum of Contemporary Art, Los Angeles.